The ultimate user experience is the one that’s invisible—it’s unexplained magic—like a gift without a special occasion. When the magic lasts, retained in the heart, beyond the memory of who created them, that’s a true legacy. As we know, lasting experiences are few and far between. This keynote will share the UX journey of Citrix—through the successes, failures and stories of the company’s former CEO. This session will wrap up our conference with the goal of expanding your insights and sparking inspiration as you take away the professional value and fun of Enterprise UX 2017. Markwas at Citrix for over 20 years, but he has been retired for a year and a half now. That has given him the time explore other, new things. 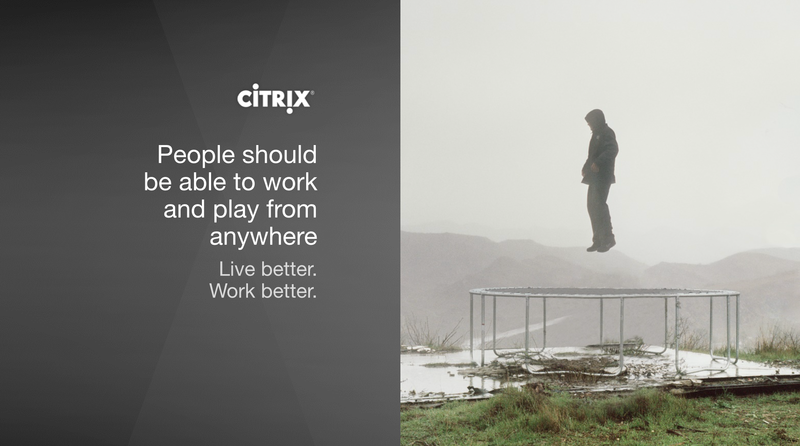 At the beginning Citrix was 50 employees, but it is 10K now. Through their work they were able to impact a tremendous number of lives of employees, partners, and customers who relied on us for their livelihoods. Everywhere he goes he has friends. This week at EUX, he met people that worked at Citrix that he had never met. The joy here is about the ongoing relationships that we were able to build – and continue to build – around doing something purposeful and meaningful for real people in this world. Mark initially struggled like a notion of legacy, because it can sound like it’s about yourself. But for him, this is about the thousands of people who brought Citrix ideas to life, and continue to help propagate these ideas. When he first got into the software business, it was about making a difference, not about making money. What he learned is that if you focused on making an impact, you could make money. You can’t receive value until you create it – you have to go first. Expecting it to come to you before you contributed is a mistake. When he struggles, he does something really important – he turns to a role model. His role model is The Moody Blues. They are an incredible group of people, his favorite band of all time. They were innovators. They invented the concept album (songs that together told a story). And this particular album demonstrated the power of stereo music on vinyl. They also re-arranged their music to perform with London Orchestra. What is even cooler is that they were in Saratoga, and he was one of the crazy idiots dancing. In the first set, they did a lot of popular songs. And in the second set they played with a broadcast of the orchestra. Their music inspired him for many years. Some time ago, he had the opportunity to meet them in person with his wife. Before they showed up, he panicked. What am I going to say to them? His wife advised him to speak from his heart. Citrix was born in South Florida. We couldn’t have built it in Silicon Valley, because of value system. At the core of the Citrix culture is that they don’t believe in rock stars, but in being a rock band. That was inspired by a Moody Blues song. They wanted people to experience the music, and they were concerned about having a cult following that was focused on them and not on the music. So this song basically said – we love you but we’re just singers in a rock and roll band. They are still at it – 50th anniversary tour. His preferred definition of legacy is that legacy it is a gift. And gifts are often remembered long after remembering who gave them. That is the magic. 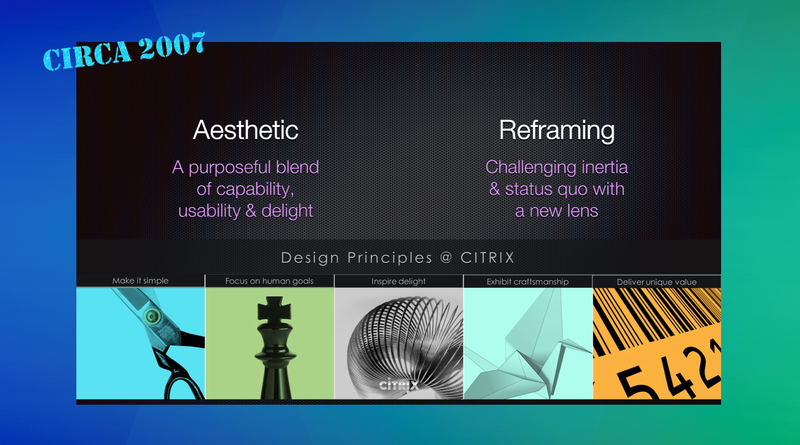 In thinking about Citrix, what really is the gift? How do you design it from the bottom up? What are you leaving as part of your organization? 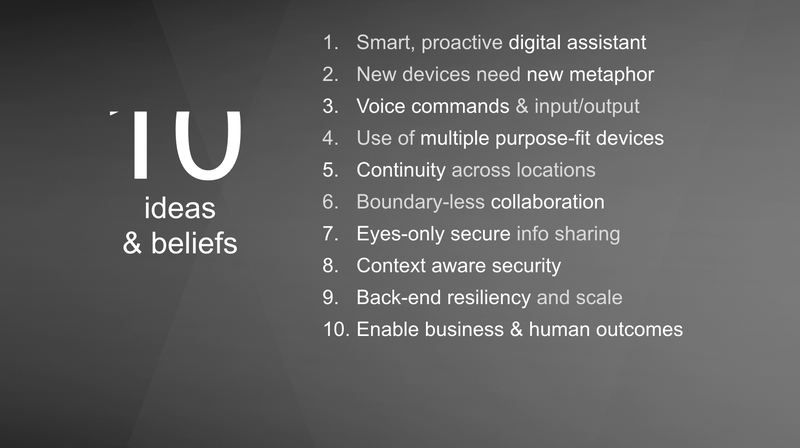 At Citrix, it was about authentic human outcomes. Allowing people to work in more flexible ways. Mark shared a powerful video about a pediatric cardiac surgeon, and how Citrix enables his to be with his family, while still paying attention to information about his most critical little patients. It was incredibly compelling. Among other things, the physician said “Lives get lost when we can’t manage information. If you are not striving to make yourself and your team member, you are going to lose people you could have saved. I want to be with family, but not leave my patients unprotected.” He uses Citrix to get the critical information that he needs, wherever he is. So … human outcomes, that is what we are designing for. Do you know what it is, do you make it visible? Do you talk about it? Does your CEO, does your management team understand and talk about it? At Citrix we were able to articulate the kind of gift we were able to give to our customer. It was about living and working better, and it resonated throughout the organization. Mark studied at the NCSU College of Design. He joked that he is an imposter CEO, because he is actually a product designer. Part of what he loved about that program is that it was in the Bauhaus Tradition – Buckminster Fuller and Frank Lloyd Wright lectured during his time there. It changed his thinking. In a world when people are trained to think inside of boxes, his design training there was life changing because this kind of education freed him from the limitations of his prior education. The focus of his education was to help him unlearn the box you have been put in. It was ultimately about how you frame, think about problems. How, ultimately you solved them. He has always been a dreamer, trying to do something that he would enjoy but that would be impactful to the world. He went back this year to deliver the commencement address. He sensed that many students are very anxious because they re not going to practice what is on their diploma. What are they going to do? They are getting something much more important than that diploma – they have a certificate in Design Thinking stapled to their diplomas. Through that they are learning to solve / see / reframe problems in ways that other programs just don’t do. After graduating, he became a draftsman. He had a mentor who told him he was great but he didn’t belong. So he went to business school. He learned about the case study approach to learning. That taught him that there really isn’t one correct answer; there are only answers that create other problems that also need to be solved. He stumbled into the forest services, and that is where he met his wife. He sold cabinets, she sold countertops. He realized that the knots in the wood resulted in waste. And he thought that they could benefit from some software to figure out what grades of lumber to buy to get maximum yield. He wrote some code and he found that he loved software more than he loved hardwood. So that little program is what launched him into software. He became VP of Marketing at Citrix in 1995, right before they launched their first really serious product and went public. They wanted to build on the idea of enabling remote access. They got to $600M in revenue, and he became CEO in 1999. They thought they would fly to the moon without doing a lot of work. But they could see they were in trouble – they had only one product, and one distribution model. More concerning was the fact that they didn’t have an opinion about the future. Their discovery process at the time was to sit around over pizzas and beer, and talk about the future. They decided they were going to pursue something like “virtual workplace”, and they decided to prototype it. But they were imagining so many things that were un-prototypable in terms of software, that the ended up making a movie. The Virtual Workplace video was released in 2001 (and it is now available on YouTube). It is a day in the life story about people trying to solve problems. Number 10 ended up being the most important – its the hardest thing on this list for any technology company. We needed some technology and then to focus on purpose – so people could live and work better. The top of the jump on a trampoline is amazing feeling of weightlessness – that was the feeling he wanted to transmit about their solutions. The photo was profound for him because it was authentic. It is not the marketing department’s picture. Moody Blues song “dawn is a feeling”. That is what we’re designing, here. How do you explain that? He had one hell of a time explaining it to his marketing team. And he knew it was essential for their continued growth. By the time they got to 2014-15-16 they started talking about mobile instead of virtual. So we updated our language, but the idea is the same. 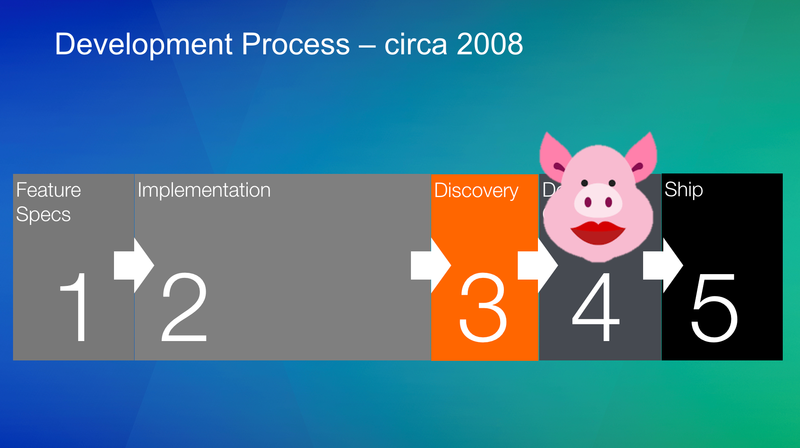 In 2008, he realized that they Citrix was in trouble, because they started to have real competition from VMware and F5. We had spent all this time with poor UX practices and disciplines. It was good enough to get us where we were, but not to compete in this new marketplace. We would be screwed if we didn’t do something about it. You just had to pay attention to your own experience with computing. The post PC era had a signfiicant influence on consumer expectations. They knew they had to start investing. So they got started. There is still plenty of this going on, which is mind-boggling. So they made the important decision to bake this appreciation for design into their DNA. They began by hiring a fantastic leader, Catherine Courage. She had incredible talent, vision, leadership, experience. We were so fortunate to recruit her. She was a design organization of one at the beginning, but she built the team from 1 to 300+ in six years. He attended Microsoft CEO conference for many years, because Citrix was a strategic partner. When the former CEO of P&G took the stage, and he told this incredible story about moving them from being product / tech company to being experience / design company. He was humble and plainspoken – this someone he wanted to follow. Catherine took that information, found Claudia Kotchka and brought her to the office to meet him. They talked about the P&G journey. She really helped them, because those conversations enabled Mark and Catherine to set expectations right. Sam said it will take 10 years – this is at least a 6-7 year journey. If you’re not in it for that, don’t start – even with CEO sponsorship. As part of their transformation efforts, they formed a partnership with IDEO and the d.school – they couldn’t have done it otherwise. They trained catalysts that had two responsibilities afterwards. (1) They had to bring design thinking into their organization. They sent people from every organization through the training – not designers. And second responsibility was (2) to hold seminars and training sessions. It enabled them to challenge the status quo. They showed they were serious, and that every employee in the company needed to understand strategic imperatives and how they would be supported. One of the things they did right and early was to quickly get to customer experience. We taught employees that everyone in the organization has a customer. Everyone serves someone else. We tried to make it actionable, so it could become a grassroots effort. In the end, that is much more effective than a top-down mandate. We had principles, we trained people, we made clear why we wanted it in the company’s DNA for business / competitive experiences. And we cared about experiences of customers, partners, an employees – everyone is a customer of someone. This continues today as Citrix. The idea of customer experience wasn’t completely new. Like most things, if formulas aren’t simple, the are not ubiquitous. He believed that they were not running Citrix for shareholders first – they were doing it for employees and customers first. And they were running it first for employees, because those individuals invest something much more precious than other people’s money – the invest their time, their creative energy, and ultimately their career aspirations. Their formula is Culture + Empathy = Pride. The best companies run on this. And it turns out this creates shareholder value, too. If you focus on what is on there other side of the equals sign, you will be all over the place. Their four core values are integrity, conviction, respect, and humility. Integrity means doing the right thing every single time, even when it’s the hardest thing to do. And conviction means not giving up on what you believe in. And balanced with respect, humility. At the time Enterprise Software was a euphemism for crappy, complex software. We wanted to beat our competitors around experience, and wanted experience to be a differentiator. But it quickly became table stakes. UX is kind of table stakes at this point. Things are moving to CX, in the more holistic sense. Everyone is a customer – whether internal or external systems. Whether a service or a product, you are thinking about customers. He doesn’t get arguments against that with business leaders. However, there are still a dearth of tools for addressing those issues, and the ones that exist are still nascent. This is the frontier going forward. The ultimate experience is not just the gift but one that outlives the knowledge of who created it. You can leave a legacy in three minutes – give them the gift of a connection. You can have and share an insight – that is a gift, a legacy. It doesn’t need to be this big thing on a tombstone. You can do it multiple times per day. He used to be freaked out about stage time, until he read Presentation Zen. When you get on stage you do the honorable thing – you give gifts. You can be really excited about him being on stage. But he thinks about it as giving a gift. He is a pragmatic optimist – sees silver linings in every cloud. He likes to smile, to show what is in your heart and should – express what is within. An in the end, he trusts his heart to make the most important decisions. His closing Moody Blues song for us – you can’t go wrong where ever you go whatever you do whatever you say say say with love. Q – You are a servant leader, but also the focal point for the company. How you maintain the balance? A – Between humility and decisiveness, you mean? I didn’t think about that. He was lucky to learn the Wizard of Oz lesson early on. The message is that everything you are looking for is in your backyard. That means that the answers are in your team. You have to believe that. Have a team you believe in. And you have to ask them for those answers. There is a book called It’s Your Ship. It’s the story of a US Navy ships, which are rated on many metrics. One ship was consistently rated the worst ship in the Navy. A new captain did cultural transformation with enlisted men and officers. There are five things where I am the final word – everything else, this is your ship. The balance is to know what those five things are – make sure they are clear. And then empowering, believing in the team you have. Q – Can you give us the ultimate catwalk, and tell the story of this vest? A – I like vintage stuff. eBay is a good place to go for that – things that will be well made. So he went out on Bay, where he has a standing search on Hermes vest. There have been two (the other is orange). It has an awesome design. If I am going to have a creative day, I’ll wear one thing. Something else for battle. In the 1970s there was a book called Dress for Success. It is very simple, and it applies to people and companies. It probably applies to nations. You don’t dress for the job you have. You dress for the job you want. When you are trying to grow a business, you don’t want to look like a start-up, you want to look like you’re here. In software, tech, any innovation business. You are inventing and selling dreams. It’s not just what you wear, but your brand around how you speak, and more. That is how you move forward. Q – Talk about Robert Graham. A – Like most very successful designers, he had such courage. He put his beliefs on the tail of his shirts – truth, wisdom, courage. Mark started buying his products. He liked that the designer put a piece of himself on every shirt. He still makes beautiful things. Q – Design, then learning to code … then VP of Marketing. Curious about that, what happened in between? The CEO of Citrix was going to retire in two years, and everyone was surprised. He was put up by the team as the internal candidate. And – he likes to say – he drew the short straw. We have all learned that your failures and your scars are the things that make you who you are, shape your character. Those are the most important experiences that make you successful in the future.